In a major contribution to roape.net, Zsuzsánna Biedermann analyses the complex reasons behind the largely fruitless diversification efforts in Botswana. Many African countries abundant in non-renewable natural resources experience the harmful effects associated with the extensive role oil, mining or gas extraction plays in their economies. Even if Botswana’s initial development based on diamond mining was spectacular, there is mounting proof that the Botswana Democratic Party – the country’s governing party since independence – has been deeply intertwined with the De Beers diamond mining cartel. Development, industrialisation and diversification remains a frustrating and elusive goal for the country. African history has taught us that diversification is key for long-term economic development. Africa’s economic diversification has been on the agenda since most countries gained their independence in the 1960s. Yet efforts at diversifying economies or export portfolios have largely been unsuccessful: in three-quarters of African countries, primary commodity export earnings still make up 70 per cent or more of all earnings and many countries depend on a single resource. These countries are prone to external shocks lacking the cushion of a more diversified export basket. Why diversification efforts have mostly failed is a vital question. Windfall gains from natural resources have often caused governance problems, corruption and strengthened the empirical basis for the natural resource curse thesis. But it would be a mistake to attribute all diversification problems to internal factors. In an effort to understand the complex reasons behind largely fruitless diversification efforts in Africa, I will try to analyze the interplay between internal and external factors through the specific case study of Botswana, and its diamond ‘beneficiation’ programme (‘beneficiation’ is a process that improves or benefits the economic value of an ore by removing commercially valueless material, which results in a higher grade, and a more ‘processed’ product). Many developing countries abundant in non-renewable natural resources experience harmful effects associated with the extensive role oil, mining or gas extraction plays in their economies (Venezuela, Sierra Leone, Nigeria, Angola, etc.). On the other end of the spectrum, the economic history of several developed countries proves that it is possible to convert resource earnings to create a sustainable growth path (Australia, Norway, Sweden, Canada, etc.). Why do some countries succeed in resource-based development while others do not? Most sub-Saharan African resource-abundant countries are unable to catch up with advanced economies and reach inclusive, sustainable economic growth. That is why the natural resource curse approach seems to be such a productive framework of analysis for sub-Saharan African countries. Economic literature identifies several channels through which natural resource abundance can harm development. What are these development traps? (1) The finite nature of exhaustible natural resources: transitory extra income allows increased consumption but only for a certain period of time. What happens when the resource is depleted? (2) Extreme price volatility: since commodity prices affect royalties and taxes paid by extractive companies, government revenues are unpredictable, and can alter dramatically from year to year which makes planning the budget problematic (for example, commodity prices dropped substantially from June 2014 to April 2015 – oil 54%, iron ore 70%, copper 40%, coal 54%). (3) The crowding out effect of extractive industries: when extraction starts local revenues increase, local currency appreciates, production shifts to the booming extractive sector and tends to sweep in workers from other areas. Tradable sectors – usually manufacturing and agricultural companies – suffer from currency appreciation and become less competitive internationally. The extractive sector usually works as an ‘enclave’ with few linkages with the rest of the domestic economy. (4) Excessive role of the state, resulting in the spread of rent-seeking and corruption. (5) Negative societal changes: natural resources are usually spatially concentrated and the interests of government, producing regions and rest of the country differ which might cause tension, unrest, even civil war. In spite of its resource abundance, Botswana has long been hailed as the African success story, an example of a developing country that defies the resource curse thesis and is able to harness its natural resources for sustainable development. Indeed, upper-middle income Botswana is characterized by low corruption rates compared to other sub-Saharan African countries, strong institutions, good governance, prudent budgetary policy and low societal tensions. The Tswana elite focused on development instead of a ‘wholesale pillage’ of resources and managed to prevent the accumulation of social tensions before the great discoveries of precious minerals. So, the Minerals Rights in Tribal Territories Act (1967) declared all rights of ownership in minerals are vested in the state. The central redistribution of resources worked well, partly due to a tribal system called kgotla (regular public meetings where leaders are held accountable). Botswana also set up a sovereign wealth fund in 1994 to facilitate government spending, ease the problem of price fluctuations and save for future generations. The country’s development based on diamond mining was spectacular, and managed to prevent most negative effects associated with resource-based development. However, Botswana’s diamond era is slowly but steadily approaching an end after five decades due to an escalation in diamond producing costs (after relatively superficial, surface mining, extraction now needs to go underground). Since 80 per cent of export earnings and 60 per cent of government tax revenues come from these precious stones, the negative effects on the domestic economy will be severe. A report by the Botswana Institute for Development Policy Analysis estimates that after diamond ‘depletion [between 2025 and 2027], GDP [will be] 47% below the non-depletion path.’ Thus, consumption patterns will need to be adjusted to these new GDP levels. But why is the country still so dependent on diamond revenues when extraction started almost five decades ago and an economic diversification programme was conceived decades ago? Diversification strategies have failed one after the other for various reasons. One example of a diversification programme is the local beneficiation of diamonds. The evolution of this downstream industry sheds light on the tight room for manoeuvre of the government. Theodore Moran summarized assumptions of the dependency theory related to the role of multinationals’ in the Third World in his 1978 study Dependence and Dependency in the Global System. An important hypothesis of dependency theory suggests that multinational companies in the third world tend to co-opt local elites so that bargaining power shifts in their direction instead of in host country’s interests. Like most countries stuck at the wrong end of global value chains, Botswana has been trying to pressurize its extracting company, De Beers – one of the largest diamond producing companies of the world, producing approximately 35 per cent of rough diamonds worldwide – for many years to consider local processing of locally mined rough diamonds as well as consenting to transferring the rights to sell at least some part of the rough diamonds to the government. 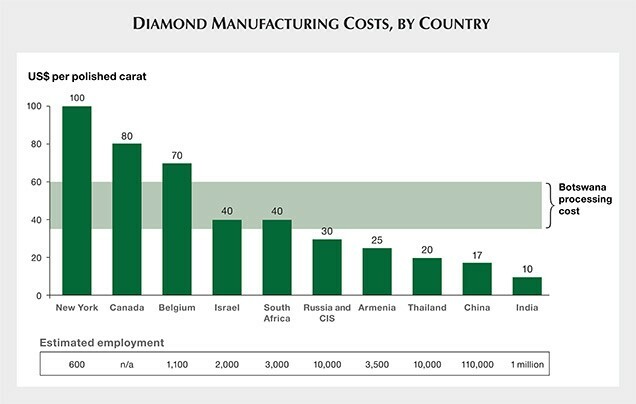 Since diamond transport costs are negligible, ever since extraction started in Botswana, rough stones were flown out to leading diamond centres located in the US, Belgium, Israel, India and China for sorting, cutting, polishing and jewellery design and diamonds were sold exclusively through the De Beers Central Selling Organization. In 2001, then managing director Gary Ralfe argued against beneficiation in an interview, saying that ‘it would be national folly to prescribe that any percentage of their diamonds needed to be beneficiated locally.’ This sentence came to represent De Beers’ three-decade long stance on local processing. Although Botswana is one of the least corrupt countries in sub-Saharan Africa, there is mounting proof that the Botswana Democratic Party – the country’s governing party since its independence – is intertwined with the De Beers cartel. Former Botswana president Ketumile Masire’s – in office from 1980 to 1998- company, GM5 was given financial assistance from De Beers on several occasions through ghost companies, as early as during his first presidency. Masire was probably also paid to step down as president, after a consultancy report ordered by De Beers recommended a transfer of power to help the BDP win the 1999 elections. In 1999, BDP received 2.4 million BWP (the Botswanan currency) support from an unknown donor from a Swiss bank account that proved to have come from a De Beers subsidiary. So in Botswana’s case, the dependency thesis seems to have been proven. De Beers secured an intimate relationship with Tswana leaders who had a profound influence on the appointments of members of the political and economic elite, who, in turn, shifted policy in the company’s interests. Due to a series of events, including De Beers’ involvement in ‘blood diamonds’, the influence of the company on the world diamond market has started to fade. 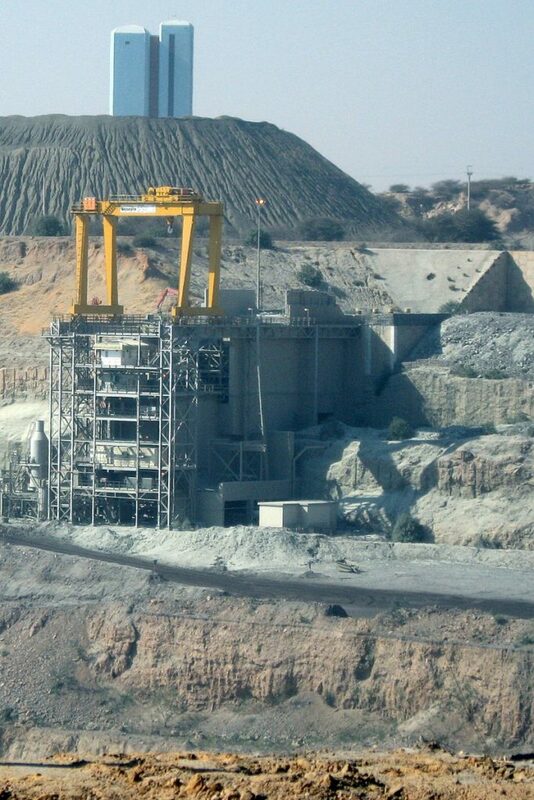 As a consequence, the company depends increasingly on Botswana for 59 per cent of its production. Due to this loss of power, Tswana pressure intensified and yielded significant results in recent years. So in 2011, De Beers agreed to move its aggregation and sorting centre to Gaborone – Botswana’s capital – and to reroute 15 per cent of its rough diamonds to the state-owned Okavango Diamond company. Therefore diamond sales are no longer confined exclusively to De Beers and the government can sell diamonds independently. Botswana’s aim is clear: become a diamond trading and production hub and create jobs for local workers in the process. Today the entry to diamond beneficiation market is difficult for several reasons. Building a viable diamond processing industry, Botswana has to compete with lower Indian and Chinese prices and more expensive but experienced and knowledgeable US, Belgium, Canada and Israel who have numerous world-class ‘diamantaires’ with immense technical expertise. Why would an investor choose Botswana over other centres when its disadvantages are obvious? The question sits at the heart of the future of the beneficiation industry. Currently, the beneficiation industry has created 3200 jobs and has become the largest manufacturing sub-sector. It will probably not become much larger unless we see the direct allocation of rough diamonds from the government to companies also increases. In a country of approximately two million people, this is a good starting point for industrialization but not enough to lower the persistently high unemployment rates and far from the situation in India where approximately 800.000 highly-skilled labourers work in the diamond cutting and polishing industry. Until diamond production in Botswana is flourishing, the government has enough leverage to pull diamond companies into the country. If estimates are correct, the country has only a decade until mining at Jwaneng mine goes underground or continues with a considerably deeper mine. Extraction will continue afterwards, but with lower output. Currently, there are major obstacles to success. Labour productivity is low but wages are relatively high compared to other diamond centres. However, in another 30-40 years with lower diamond output and a direct rough allocation system the country could acquire the necessary expertise to build the ancillary infrastructure. Conscious consumers could also play an important part, with diamond sellers emphasizing that locally beneficiated diamonds have contributed to Tswana capacity building and the fight against poverty and unemployment etc. To conclude, Botswana is facing major difficulties related to the finite nature of diamond resources and the failure of economic diversification efforts. These problems result from the extreme influence the De Beers cartel has had on the country and the world diamond market for decades. The Tswana elite, largely co-opted, had failed to truly represent the country’s interests against the De Beers cartel. Diamond beneficiation might still take root in Botswana, but with a limited number of jobs it provides only a partial solution to further economic development. Zsuzsánna Biedermann is research fellow at the Institute of World Economics of the Hungarian Academy of Sciences, she has written on the economic context of conflicts in the Great Lakes Region of Africa. Currently, she is working on the resource-curse and challenges of resource-rich sub-Saharan African economies. Biedermann is also editor and contributor of a major Hungarian blog on African economies: http://www.afrikablog.hu. Featured Photograph: High-security administration building and transportation machinery at the Jwaneng Diamond Mine, Botswana.